Kepromec is very effective in the treatment and control of internal and external parasites in cattle, sheep, goats, pigs and camels. 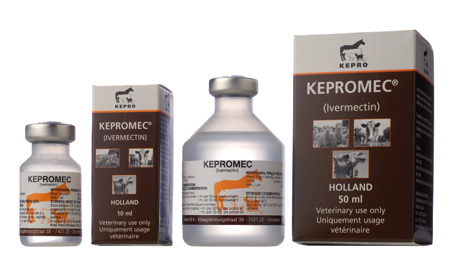 Kepromec is indicated for the treatment and control of gastrointestinal roundworms, lungworms, grubs, screwworms, fly larvae, lice, ticks and mites in cattle, sheep, goats, pigs and camels. Warble flies (parasitic stage) : Hypoderma bovis, H. lineatum. Mites : Sarcoptes scabiei var. suis. Do not use in dairy animals within 28 days prior to calving. Soft tissue swelling at the injection site has been observed. Cattle, sheep, goats, camels : 1 ml per 50 kg bodyweight. Pigs : 1 ml per 33 kg bodyweight.